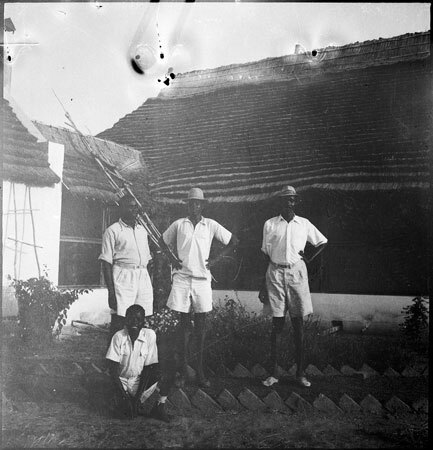 A group portrait of four Dinka men outside the large thatched District Officer's building in Gogrial. The D.O. there during 1948-1953 was Ranald Boyle (known in Dinka as tim atiep or the shading-tree, which in turn is a metaphor for the black macar cattle colouring). Morton, Chris. "D.O. 's office in Gogrial" Southern Sudan Project (in development). 03 Jan. 2006. Pitt Rivers Museum. <http://southernsudan.prm.ox.ac.uk/details/2005.51.115/>.